If you somehow haven’t heard of Larabars, they are tasty snack bars made from dried fruit/dates and nuts. They usually have 2–6 simple ingredients, depending on the flavor. As with many things, if you make them yourself, you can customize, save money, and get the satisfaction of making something. They are easy, and there are tons of copycat recipes online. However, most recipes call for a food processor, so I was curious how they would come out with just a Vitamix; perfectly well, it turns out. I have a few Vitamix-specific tips at the end of the post, as well as a homemade vs. packaged Larabar price comparison. 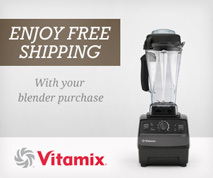 This is about the minimum that will blend in a Vitamix with the classic 3″ blade. If you only have the wide G-Series container with 4″ blade, double the recipe. I haven’t tried making large batches, but my guess is that you may run into overheating trouble if you try to blend more than double this recipe at once. Check to make sure that no pits remain in the dates, since a pit would blend up into unpleasant shards. Blend at maximum speed while using the tamper to push down corners of mixture until it comes together into a sort of paste, which should happen in about 30 seconds. It’s fine if there are visible pieces of nuts. If you blend until it is perfectly smooth, the bars will be stickier. The mixture will be thick, so a long, rigid, skinny spatula is useful if you want to get it all out of the container. Most of the time, my favorite Vitamix spatula is this silicone one, but for this recipe, the nylon Vitamix-branded ones are better because they are more rigid. 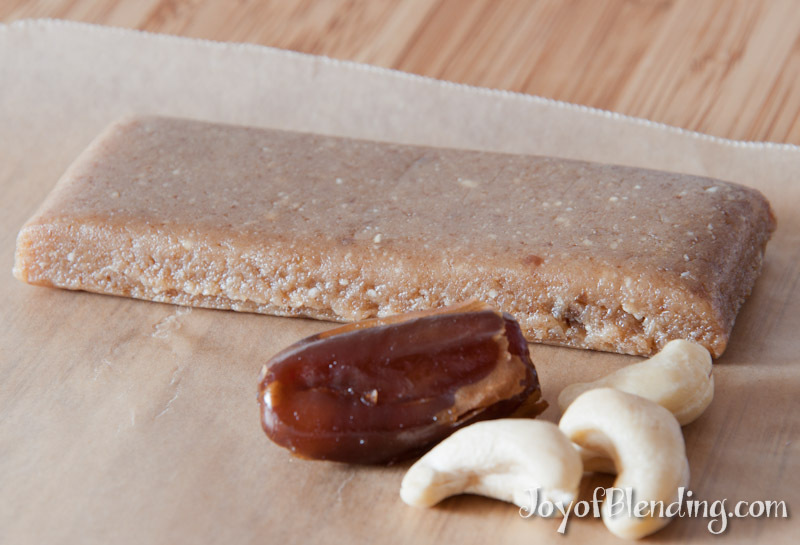 Mold the bars by pressing the mixture on wax paper, then cutting it. (To make them more uniform I folded the wax paper over and rolled them out.) Then wrap the bars individually in pieces of wax paper and refrigerate, where they should keep for at least a couple of weeks. You can also play around with all sorts of flavors: other nuts, other dried fruit (but keep at least some dates for their binding property), coconut, cinnamon, etc. If you want more inspiration, check out the official list. The remnants of this blend go well with almost any other Vitamix recipe, so if you feel like blending something else, you can do a “cleanout” recipe. Don’t worry about scraping out every last bit of date-nut mixture, and then just go ahead with another smoothie, soup, ice cream, Frappuccino, almond milk, etc. After a normal wash cycle (warm water + dish soap blended ~30 sec) you may notice some of the mixture stuck on the metal piece underneath the blades. Don’t panic! Just leave it soaking with warm water for 30–60 minutes, then run another wash cycle. That’s all I’ve had to do, but in principle you might have to do a second soak. 1 homemade (1.7 oz) Larabar = $0.50 (61% less than packaged). A friend mentioned that you can get date paste from some Middle Eastern food importers. It can be cheaper than whole dates (as low as ~$2/lb) and may be less likely to have stray pits. It sounds like it would work great for these bars, so keep an eye out. Adam, I’m so excited to read this post as I love larabars. Thanks for experimenting and generously sharing new recipes. A couple questions: 1) If using dates paste, what’s the quantity? 2) How much is “splash” of vanilla extract in terms of teaspoon? If you have a scale, that’s going to be the most accurate, and you can just follow the weight in the recipe. 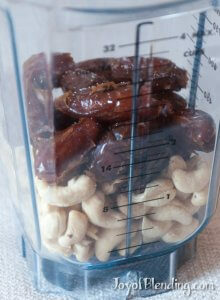 If you have to go by volume, I’m guessing the 3/4 cup of dates in the recipe is about a 1/2 cup of packed date paste. The vanilla amount is personal preference, but I’d say start with somewhere between 1/8 and 1/4 tsp. I did mine with peanuts (cheaper than cashews!) + hemps seeds. It’s delicious! Your machine will likely come back to life after it cools off. It has a thermal override, which switches it off before permanent damage is done. I agree that putting the dates in first would make it tougher to blend. All of my recipes have ingredients listed in the order you add them. And I also have a page with more details about overheating. Alright, so it looks like it just needed to rest to cool down, but I think next time I’m going to start with just the nuts, then will add the dates a bit at a time, or I’ll just use a food processor. I recommend adding them together, just with the nuts on the bottom layer. (In my opinion, it’s better if the nuts don’t turn into a nut butter.) And make sure you’re running it at top speed. Thanks for sharing! I was contemplating buying a food processor simply because of my desire to make larabars—so I googled if it was possible to use my Vitamix and I found this. Thanks for the recipe, and saving me from buying another machine.